Do you find you have a particular myth, fairy tale, or other text, that you return to again and again, that serves as a sort of ur-text/blueprint for your own craft? How has this shaped you as an artist? Aaron T. Milstead is the author of They Don’t Check Out and was featured in Road Kill Volume III. 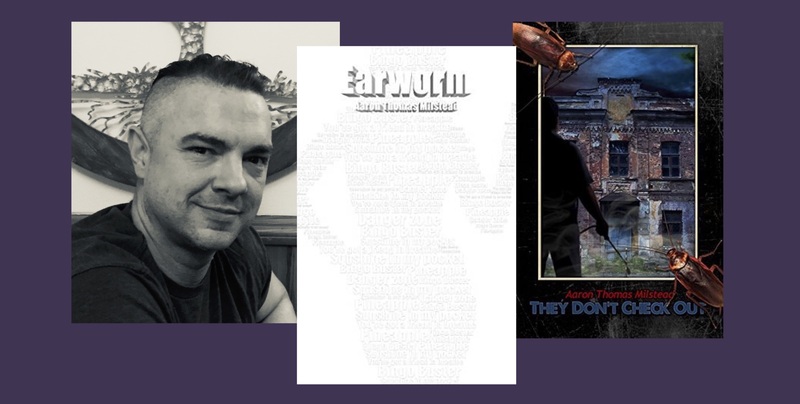 His most recent novel, Earworm, was published in March of 2019 and that summer he will be featured in a science fiction anthology called Crash Code. He lives in the Piney Woods of East Texas with his wife and three children. Mythology began to shape my view of the world at a very young age, in fact one of my earliest memories is of my mother reading The Hobbit to me as a bedtime story, a few pages at a time. Ironically, when I was old enough to read alone, I was enamored with the same Norse myths that so heavily influenced Tolkien. I must have read Edith Hamilton’s collected mythological tales (including Greek and Roman stories along with the aforementioned Norse ones) a hundred times. I can still vividly remember the wonder of imagining a baby Hercules as he intercepts two large serpents sent by Hera to kill him in the crib and how he casually squeezes them both to pulp as he joyfully giggles. Growing up in the Bible Belt I was also heavily influenced by Christian narratives that were presented as absolute truth next to these similar tales from other cultures that were presented as pure fiction. This contradiction still informs much of my thoughts about contemporary culture and frequently manifests in my own writing. Ironically, I learned, much later in life, that Tolkien’s writing was just as influenced by the Bible and his Catholic faith as it was by Norse mythology. At a very young age (seven or eight) I experienced a cognitive dissonance as I read about Isaac and Abraham and had to conceptualize a god that would ask a loyal servant to sacrifice his only child as a demonstration of faith. This narrative precipitated an existential crisis. Trauma. As has often been said, “writing is therapy”, and this narrative has been the crux of much of my writing. Luckily, around this same time I was exposed to a new form of mythology when my parents bought me a stack of comic books to pacify me during a trip to Colorado. The transition was natural and there were several familiar faces: Thor, Odin, Hercules, Zeus, Amazons and countless others. Even the heroes with different names were variations of archetypes I had already grown to adore. I would later understand this dynamic through the writings of Joseph Campbell and Carl Jung. What amplified my love for these myths was that these heroes were contemporary and somewhat relatable. It was when I was thirteen and read Alan Moore’s magnum opus The Watchmen that I realized mythology could be completely realistic. He dealt with topics that comic books had previously avoided such as racism, mental disabilities, and sexual assault. He presented the notion that heroes could be just like real people: endlessly flawed and filled with human frailties. That was the moment I realized it was no longer enough for me to just scribble the occasional story in a notebook and never to be seen again; I aspired to one day be a real writer. My most recent novel, Earworm, combines two other types of mythology that influenced me as I matured: Southern Grotesque/Gothic and Lovecraftian Horror. As different as those influences may seem, there are common threads. Transgressive or irrational thoughts. Racism. Dark humor. Perhaps most of all is the general sense of alienation; an understanding that the world is not as pure as it may seem on the surface and that beneath a thin veneer of optimism is always horror. Flannery O’Connor once said that, “The truth does not change according to our ability to stomach it.” This is a concept that I explore as my protagonist, Ripley McCain, faces his own mortality and the loss of his only relationships. H.P. Lovecraft once said that, “The oldest and strongest emotion of mankind is fear, and the oldest and strongest kind of fear is fear of the unknown.” This is another concept that I explore as Ripley must determine if his fatal brain disease has caused a schizophrenic break or if the voices in his head are coming from a symbiotic entity that crawled inside his ear and nestled in next to his amygdala. Much like the authors that have inspired me I continue to recontextualize the myths that have shaped my understanding of the world. I think there are a couple of myths and fairy tales that I’ve come back to again and again. The Snow Queen is a favorite character in her various costumes and appearances (a version of which you’ve been kind enough to publish), the legend of Philomel, the Fox-Wife myth from Japanese mythology, and the Melusine myth, which I reference rather non-explicitly in every book. The idea of a woman being a monster or a villainess, the idea of transformation both internal and external – themes I return to over and over. I’ve also noticed lately a lot of poems about solar weather, eclipses, moons, which means I may be becoming a witch myself! Gwendolyn Kiste is the author of the Bram Stoker Award-nominated collection, And Her Smile Will Untether the Universe, the dark fantasy novella, Pretty Marys All in a Row, and her debut horror novel, The Rust Maidens. Her short fiction has appeared in Nightmare Magazine, Shimmer, Black Static, Daily Science Fiction, Interzone, and LampLight, among other publications. A native of Ohio, she resides on an abandoned horse farm outside of Pittsburgh with her husband, two cats, and not nearly enough ghosts. You can find her online at gwendolynkiste.com. There have been so many fairy tales and myths that have informed my work over the years, but if I had to choose just one that continues to inspire me the most, it has to be Baba Yaga. Unlike the more ubiquitous tales such as “Little Red Riding Hood” and “Sleeping Beauty,” I didn’t come across the Baba Yaga tales until I was well into adulthood. Immediately, though, I connected with the duality of how she’s depicted in the various legends. Baba is too often reduced to a simple caricature of evil, but when you look deeper at the stories about her, she is anything but straightforward. Her character is complex and malleable, and she’s taught me perspective is everything. Historically, it’s been far too easy for audiences to reduce a powerful female character to a stereotype of danger. While Baba Yaga certainly has her more sinister side, she’s as likely to help the protagonist in some stories as she is to hinder them, making her one of the only fairy tale characters who has served both as an antagonist and a traditional “wise old woman” archetype. Exploring Baba Yaga and the stories about her has challenged and guided me in imbuing my own female characters with more nuances. No one is all good or all bad, and women in literature deserve better than the surface-level characterizations that they’ve so often received in the past. For me, Baba Yaga has become a perfect template and inspiration for how to move forward in telling better stories for women. And besides, who wouldn’t want to ride around in that mortar and pestle of hers? Our first respondent is Carolyn Turgeon, who is the author of five novels—Rain Village, Godmother: The Secret Cinderella Story, Mermaid, The Fairest of Them All, and the middle-grade The Next Full Moon, most of them based on old-time fairy tales—and, more recently, The Faerie Handbook and The Mermaid Handbook. 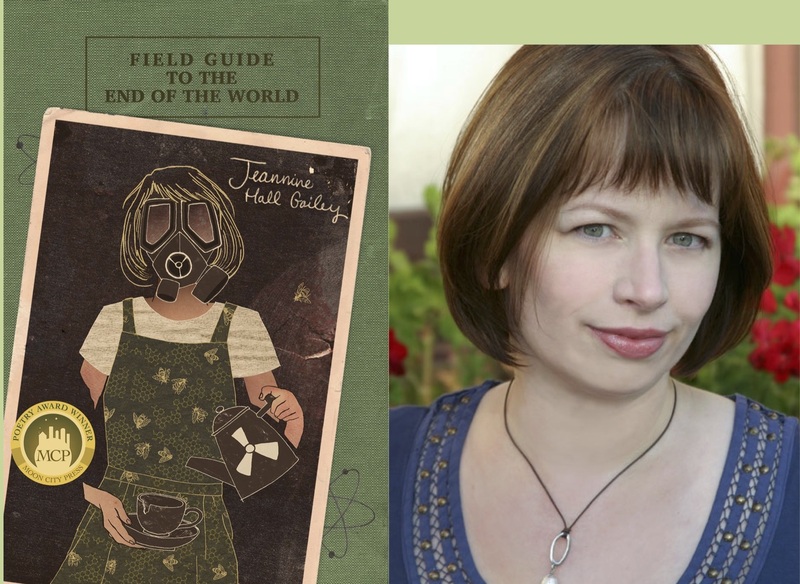 She’s also the editor-in-chief and co-owner of Faerie Magazine, a quarterly print publication about which the NY Times said, “It’s as though Martha Stewart Living and Edmund Spenser’s The Faerie Queene had a magazine baby.” Currently she’s working on a third handbook and a new novel. She lives in Baltimore. Read more at carolynturgeon.com and at faeriemag.com. I don’t know that I can point to one text. I read so many myths and fairy tales as a child that I’m sure they’ve all combined into one giant blueprint that has shaped most of what I’ve done and do as a writer. The older I get, the more I realize how fundamental those first texts were, actually! Probably one of the earliest for me was Bullfinch’s Mythology, which I believe I read in an elementary school class and became obsessed with and am probably still obsessed with, at some level. I started reading as much as I could about those myths. I loved those glamorous gods and goddesses, those dazzling hybrids and transformations. I loved the moment when Achilles kills the ferocious soldier during the Trojan war, then lifts the soldier’s helmet to find the queen of the Amazons, Penthesilea. Her long hair tumbles out, and he—shocked and devastated—falls madly in love with her in the same moment he realizes he’s killed her. It’s so dramatic and gorgeous and tragic! To me, the image of this beautiful, wild maiden transforming slowly into a leaf-covered tree is so lush and rich and jam-packed. That such beauty (and freedom, possibly, in her going completely wild) would stem from a moment of such violence—that she had a way out, that she could become something else, something beautiful and wild, instead of the alternative, which was to be raped. Probably as a young girl about to enter puberty, with a body that was already changing and not by my own choice, this appealed to me: the idea of a wild, untouched girl transforming into a tree and in this way staying wild forever, a daughter of Diana. Of course, Apollo then takes leaves from the tree/Daphne to make himself a crown of laurel leaves, and this becomes the symbol for all poetry, right? Which is weird and disturbing, the idea that poetry is sort of born from that kind of violence and violation (and beauty). As a college student and graduate student in Italian literature later in my life, I studied the poetry of Petrarch, which is full of references to Daphne and the laurel tree (which comes to stand in for his own love, Laura, who dies as a young woman), and I was fascinated by that same weirdness. And I suppose it’s possible to look at Daphne as a solely tragic figure, trapped forever in this rigid form, the leaves of which provide the content of so much human poetry. But to me she’s a sort of feminist symbol, in her wildness and her beauty and in the choice that she makes. I know there are moments in my life—and in many women’s lives—where that sort of choice would have been welcome. In my own writing, I think I circle back and back to these sorts of moments involving transformation, and violence, and magic, and beauty, and that same strand of wild feminism, like when the little mermaid takes a potion to split her tail into legs or when the fairy godmother spreads her massive, painful white-feathered wings, or when Rapunzel (who becomes Snow White’s stepmother in my book The Fairest of Them All) eats the bloody heart.